The Technology Salon on Big Data and Evaluation hosted during November’s American Evaluation Association Conference in Chicago opened these questions up for consideration by a roomful of evaluators and a few data scientists. We discussed the potential role of new kinds and quantities of data. 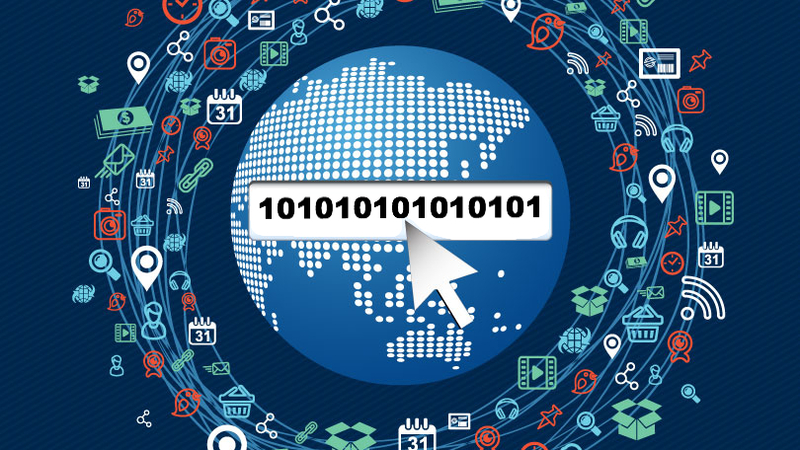 We asked how to incorporate static and dynamic big data sources into development evaluation. We shared ideas on what tools, skills, and partnerships we might require if we aim to incorporate big data into evaluation practice. This rich and well-informed conversation was catalyzed by our lead discussants: Andrew Means, Associate Director of the Center for Data Science & Public Policy at the University of Chicago and Founder of Data Analysts for Social Good and The Impact Lab; Michael Bamberger, Independent Evaluator and co-author of Real World Evaluation; and Veronica Olazabal from The Rockefeller Foundation. The Salon was supported by ITAD via a Rockefeller Foundation grant. The first task was to come up with a general working definition of what was understood by ‘big data.’ Very few of the organizations present at the Salon were actually using ‘big data’ and definitions varied. Some talked about ‘big data sets’ as those that could not be collected or analyzed by a human on a standard computer. Others mentioned that big data could include ‘static’ data sets (like government census data – if digitized — or cellphone record data) and ‘dynamic’ data sets that are being constantly generated in real time (such as streaming data input from sensors or ‘cookies’ and ‘crumbs’ generated through use of the Internet and social media). Others considered big data to be real time, socially-created and socially-driven data that could be harvested without having to purposely collect it or budget for its collection. ‘It’s data that has a life of its own. Data that just exists out there.’ Yet others felt that for something to be ‘big data’ multiple big data sets needed to be involved, for example, genetic molecular data crossed with clinical trial data and other large data sets, regardless of static or dynamic nature. Big data, most agreed, is data that doesn’t easily fit on a laptop and that requires a specialized skill set that most social scientists don’t have. ‘What is big data? It’s hard to define exactly, but I know it when I see it,’ concluded one discussant. Replacing a conventional design with a big data analytics design by replacing regression based models with systems analysis. For example, one could use systems analysis to compare the effectiveness of 30 ongoing interventions that may reduce stunting in a sample of villages. Real-time observations could generate a time-series that could help to estimate the effectiveness of each intervention in different contexts. 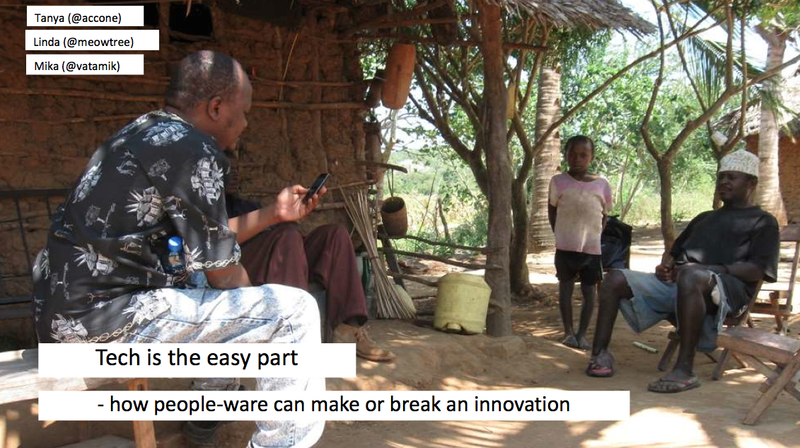 There’s a popular saying amongst the tech and development crowd that 10% of an ICT4D initiative is the tech and the rest is…. well, the rest. I’ve recently heard a modified version that says 5% is the idea and 10% is the business model, and the other 85% is…. well, the rest. The ‘rest’ is mostly made up of people, culture, context and the stuff of anthropologists. At the Slush conference in Helsinki in November, I joined a short ‘Fireside Chat’ with Tanya Accone (UNICEF) and Mika Valitalo (Plan Finland) about the importance of that other 85-90%, which Tanya referred to as ‘peopleware’. She went on to note that conventional wisdom is that ‘content is king,’ however a key takeaway from her work in the mobile and social entrepreneurship space is that content been deposed by context. For example, when working with the U-Report project in Liberia, lessons from other countries where it had been rolled out were incorporated, but they had to be contextualized to make them work in Liberia. This involved talking and working directly with youth to ensure that the programming could be adapted properly. Mika agreed that ‘peopleware’ is a critical consideration. “I’ve witnessed this 10:90% ratio several times when co-designing and supporting projects using technology for social impact in African countries,” he said, and told the story of working on enhancing birth registration in Kenya, where the slow and manual flow of information between people and the government seemed to be a key challenge that could be tackled with use of mobiles and computers and applications. “However, the deeper we dug the more varied the challenges seemed to be. We realized that people might be reluctant to register children when local practices were not in sync with the existing legislation. For example, if men are marrying girls under the age of 18, they might not like the idea of birth registration as it would prove a girl’s age. People living near the Kenya-Tanzania border might not want to be identified as being from one or the other country, because being unregistered may allow them to move back and forth across the border more easily and receive some type of benefit or commerce opportunity. I shared two of the key points from the Technology Salon earlier in the week on the topic of start-ups and social impact: a) the importance of partnership and collaboration (eg, people), and b) knowing the local context — not just the technical landscape, but people and culture. 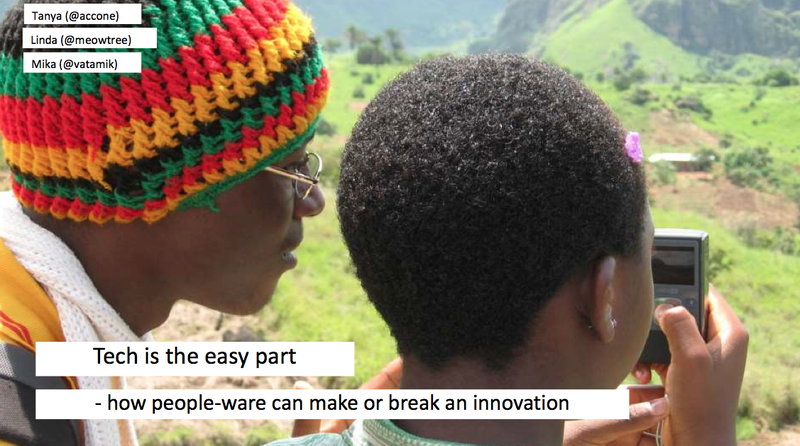 These two aspects were really highlighted for me when I was working on a project in Cameroon that trained youth to use mobile phones to make short videos that they used to organize and advocate for change in their communities and more broadly. The donor was a large mobile phone manufacturer who assumed youth would use their higher-end phones to create the videos. The youth, however, were much more familiar with simple phones like the Nokia 1100. The phones we purchased in order to get good video quality had too many layers and folders and features. So we ended up getting some Flip cameras, because what we really needed was a push and shoot video camera, and this design was a better fit for low-income rural youth who had limited experience with technology. We also realized that though the training was set up for youth, community adults were really interested in learning to make videos too. So we had to find ways to engage them so that they would not feel left out and so that we could ensure their continued support for the youth’s efforts. This meant we had to spread our resources out a little further than we had imagined, but we saw it as necessary. In all these processes we had to balance the context and reality on the ground, the expectations of the youth and community, expectations of our local partners, and those of the donor. Tanya added that achieving success with social impact sometimes means rethinking your business model, because you’re in pursuit of the double dividend of financial return and social impact. She gave an example in Burundi where only 3% of the population has access to the electricity grid. “You would think it’s a market ripe for alternative energy solutions. But many businesses avoided it because their existing retail and distribution models simply would not work in that context. 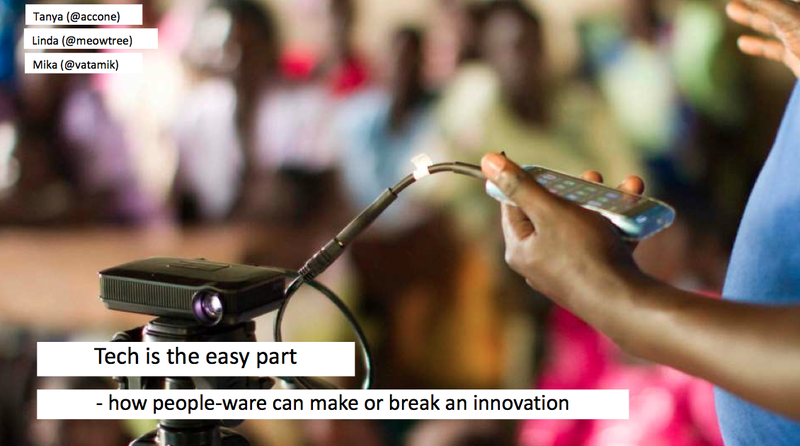 It took deconstructing and reconstructing business models to create something that does work — a network of microfinanced microfranchises operated by village-level entrepreneurs.” Now the families use robust, fast-charging LED lights recharged through a pedal-powered generator, a system that also recharges mobile phones. Another aspect is understanding the value proposition, she said. It would seem to be basic business, but all too often well-intended initiatives forget this and rush in with a cheaply-made solution. “In the process, they trample over the basic human dignity of their target consumer or beneficiary.” She suggested keeping in mind that people with limited resources are among the most discerning consumers because they don’t have disposable income. They are cost conscious, and equally, they are looking at value for money and return on investment in the durability, feature sets and total cost of ownership of everything they buy and value. This means that more energy-efficient chips, better battery technology, and robust handsets are important to economically challenged users. Mika shared an example where the technology that was introduced carried almost too much power with it. In this project, a mobile phone was loaded with videos and connected to a portable projector. Daycare workers and parents were able to watch good childcare practices from model early childhood care and development centers. “What we found out was that using new technology not seen before sometimes amplified the message so much that caregivers wanted to discard what they already knew and replace it with what they saw on the screen from the model daycare centers.” Though the project showed the power of tech, unintended consequences may come up at the intersection of software, hardware and ‘peopleware’. Mika talked about another project in Uganda that supported parents’ involvement into school activities. Plan realized that men were more willing to come to parent-teacher meetings once they introduced a mobile SMS service through which they sent invitations. The technology lowered the threshold for men to participate in issues they might have previously considered ‘women’s issues’. These subtle dynamics in the local context can have a big influence on how an innovation works, he noted. I added that it’s important to understand who has access to and control of devices, and to ensure that a product or service is valuable to people in the long-term. So first — Who owns the phone? Who controls it? 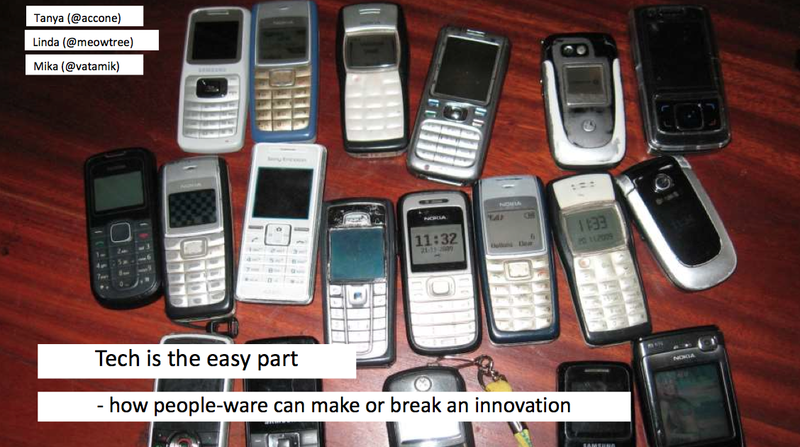 Often the story is that everyone has a phone but you may find that some people own 2 phones, some don’t have any. You may find that the people you least expect to have phones have them or can access them, and those you’d think would have a phone don’t. This is critical especially when working with girls and women who typically have lower access and control – and of course you should be sure the project is including girls and women! Also, you may be working with people who have very little disposable cash – but if your application or idea saves time and money and meets a real need, they may be willing to move their resources from one thing to another. For example, using solar for light and charging up phones can save money and time as well as eliminate the health risks of kerosene lamps. However, you need to make sure that what you offer is a long-term and sustainable change. When people have limited resources, they’ll be hesitant to invest in something new if they are not assured that it will be available, sustainable and cheaper in the long term. Lastly, as Mika said, partnering with non-profits can offer start-ups a way to reach communities, because some non-profits are quite well-known and respected by the community (though of course, some are not too!). But ethical non-profits will not risk their reputations on ideas that they do not believe in, that are unconvincing, or that seem to take advantage of the poor. Start-ups will need to have clear ideas and evidence that a proposition is solid, because most non-profits have a low tolerance for risk and failure and (one hopes) a higher ethical standard than a basic money-making operation. People are your critical success factor. “People” include your end-user as well as those that you may be partnering with. Context is king! Understand the social dynamics, know who owns and controls the device, know what people spend money on. Build a better business model. Understand the value proposition — Figure out how your application/tool/innovation can help save precious $ and time. Understand your partners — Remember that brand and reputation are very important to non-profits, and they don’t like risk. Thanks to Tanya and Mika for co-collaboration on the Fireside Chat and this blog post!